My attention has been drawn to the Breast Cancer Fund Climb Against the Odds expedition to the top of Mt. Shasta in June this year. At 14,162 feet, Mt. Shasta stands as the most striking mountain in Northern California and is home to California’s largest glaciers. Besides training for the peak attempt, climbers commit to raising a minimum of $5,000 for the Breast Cancer Fund’s work to prevent the disease. We provide the support to achieve both. The Breast Cancer Fund identifies – and advocates for elimination of – the environmental and other preventable causes of the disease. When I was a novice at Shasta Abbey in the early 1980’s I was with my ordination sister Goso in the bath-house, where speaking is strictly forbidden. Looking up at the mountain through the window she whispered, We’ll climb that one day. Sadly she didn’t live long enough for us to do that. She died in November 1986, of breast cancer. Thanks for the reminder of this and something that we forget as men is that we can also get breast cancer. It is a very small percentage of men, but men often have a lots of complications because of not recognizing a lump in the breast area as a possible cancer. So, we should also be aware of that! We just celebrated the holiday of Wesak, where those in attendance ring the temple bell 108 times. First, the priest of the temple; then, anyone who will reach a significant age in the coming year. The age of 60 is said to represent seeing the mountain to ascend. Some climb the mountain earlier than that. Thank you, Rev. 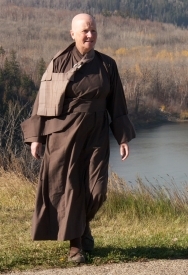 Mugo, for drawing such a wonderfully varied potpourri of words and images under the umbrella of Buddhist practice, and congratulations on 27 years of monastic life.